Among cooking utensils, the pressure cooker is a particularly effective device to successfully cook any type of vegetables. Be careful though to choose a reliable model for a security issue! I offer you a detailed buying guide: here are the best pressure cookers of the moment based on the number of people in your household, with their advantages and disadvantages! 1. Seb Nutricook P4221403: The Best Pressure Cooker In Market? Do you remember old granny’s pressure cooker? This concept was imagined and invented by the brand SEB, which has been working for 160 years in the production and marketing of innovative products to better express culinary flavors in all its forms. Even today, the brand excels in its field, with continuous innovations and new concepts. She offers us here the Seb Nutricook P4221403, a model that has no shortage of assets to reduce its future owners. 4 Programs: Even though this model is not electric, it has 4 cooking programs. This will allow you to obtain optimal cooking for different types of ingredients such as vegetables, starchy foods, fish, meat, etc. Your pressure cooker will automatically alert you once the optimum cooking time for the program you have selected has been reached. Each program also has its own level of pressure. 2 in 1: This model provides two functions at once, that of a pressure cooker in which your dishes are simmering, and that of a steamer. In this regard, it should be noted that the Seb Nutricook P4221403 also offers a unique cooking mode, with its gentle steam system. After cooking under pressure, the soft steam cooking without pressure, lid closed and fire off, will take over, to perfect the cooking of your food. Vitamin Basket: This accessory preserves the most vitamins and minerals possible when cooking, compared to a basic pressure cooker or a traditional oven. This pressure cooker will allow you to preserve the maximum nutritional qualities of each food while allowing you to cook quickly. Ease of Use: The Seb Nutricook P4221403 adopts a new system of opening and closing, the arch system, allowing you to open or close the lid even with one hand. Forget the tightening of the famous screw as on the old pressure cookers, a slight manipulation is enough to engage or disengage the clipping system of the cover, which guarantees a perfect seal. LCD Display: A small LCD screen is located on the top of the lid, informing you in real time so you can better monitor the cooking process of your food. Large Capacity: With its 8L capacity, the Seb Nutricook P4221403 will suit large families or those who often receive guests. Fits any Type of Fire: In fact, this pressure cooker knows how to be versatile and adapts to any type of fire. Thanks to its Diffusal Bottom 5 which is more resistant, it can support even the most powerful induction hobs. A bit heavy: But its large capacity of 8L is also a small inconvenience, the pot is a bit heavy especially when it is loaded. If you find that the previous model is a little too much to your taste, or that its price far exceeds your budget, rest assured, because the brand SEB has designed several models to meet the needs of each customer. In fact, here is the Seb Clipso Plus P4371406, the model that probably offers the best quality/price ratio in the market, in the category of pressure cookers 8L. Proposed at just under 100 euros, this model is also full of assets to seduce. Ease Of Use: Decidedly, the function closing and opening with one hand have become the key criterion on the latest models of the mark SEB. The Seb Clipso Plus P4371406 also offers this great ease of use, thanks to its arch system to easily lock or unlock the lid. In addition, it has foldable handles, which also facilitates the storage of the product which becomes less bulky. 2 Cooking Programs: Despite its price less than 100 euros, this model still has two cooking programs, which will make it much easier for you, since each program has a well-defined level of pressure. You will then enjoy the optimal cooking of your food, depending on the program chosen in line with them. To know that the right pressure also makes it possible to preserve at the best the nutritional qualities of each food, during the cooking. 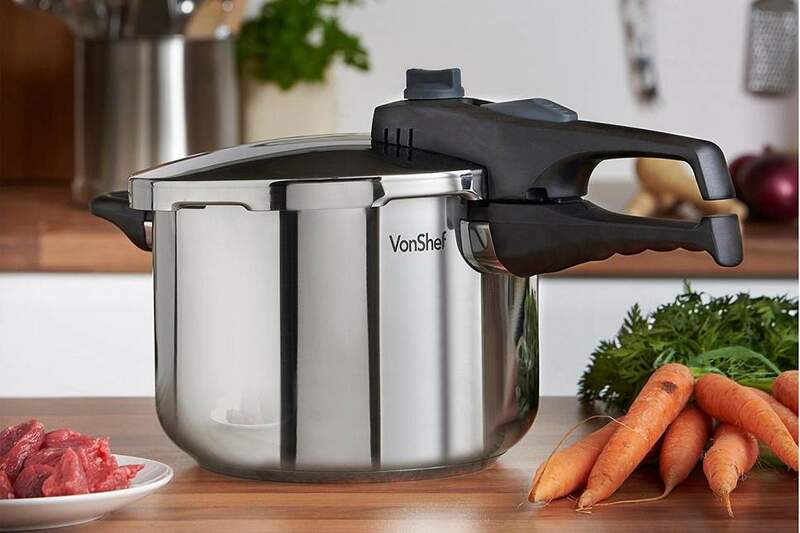 Versatile: With this pressure cooker, you can implement several types of recipes and dishes, from starter to dessert. Some dishes to simmer, to brown or steaming dishes, desserts, you just select the cooking mode and respect the duration. In addition, this pressure cooker also knows how to adapt to any type of fire, including the induction hob. Stainless Steel Steamer: Indeed, it is a product 2 in 1, because in addition to the primary function of a pressure cooker which is to cook under pressure, this model is also delivered with its steam basket in stainless steel, for offer you the possibility of steaming, more preferable for cooking vegetables, for example, in order to keep the maximum nutritional intake. You will enjoy healthier and tasty cooking. Safe: The Seb Clipso Plus P4371406 is a safe product, its closure system offers a perfect seal without effort, it even includes a pressure indicator, with 5 levels of security. 3 of these are in overpressure mode. Easy To Maintain: Rest assured, all components, except gaskets and valves, are dishwasher safe which will make cleaning much easier. Water in the lid: Some users have reported that water tends to accumulate in the lid, which can become annoying when you move the pressure cooker. It may be necessary to shake it after each use or after each cleaning, to release all this water. If you find that a capacity of 8L is a little too much and that a capacity of 5L could perfectly suit your needs, this would save you the price of your future pressure cooker. Precisely, the brand SEB has everything planned and has a cheap model with a capacity of 5L. Proposed at just under 75 euros, this pressure cooker does not lack qualities to convince you to buy it with your eyes closed. Here are some of his greatest qualities. 2 in 1: With this model, you will not have to use two different tools for two different results. The Seb Clipso + DUO P4605100 is the first 2-in-1 pressure cooker of the brand. It allows both cooking simmered with the “casserole” mode and steaming dishes with the “pressure cooker” mode. For this, simply operate the handle on the smart cover. This one has two positions allowing you to choose one of the modes. One-Handed opening/closing: When one remembers the handling of grandma’s old pressure cookers, opening and closing these machines was far from easy. With today’s SEB models, we can feel the effect of innovation, because currently, the opening and closing of the lid can be done with one hand. Indeed, this model makes you enjoy great ease of use. Compact and Lightweight: Despite its large capacity of 5L, Seb Clipso + DUO P4605100 knows how to remain discreet in terms of measurements. Indeed, this model is known to be both compact and lightweight, which greatly facilitates its use and especially its storage. It can fit easily in one of your drawers (provided it is not a pocket tissue anyway). Design: If you are more familiar with aluminum or all stainless steel on the pressure cookers, we are pleasantly surprised with this model which sports an unusual design. Indeed, he wears a garnet robe with a white lid. Of course, it remains a stainless steel part, probably to reassure future buyers as to its reliability and robustness. Security: This model also incorporates the 5-level security system, including 3 in overpressure mode, which will guarantee you a safe use. No Timer: Hard to find anything wrong with this model. We regret that the Seb Clipso + DUO P4605100 does not come with the famous removable intelligent timer found on other models in the range Clipso. Pressure cooker: How does it work? With a simple pot or saucepan, simply dip the food in with water or oil, put on the fire and remove after a certain period. The use of a pressure cooker is virtually the same, with the simple difference that steaming must be taken into account. Here are some explanations. With a pressure cooker, the cooking is faster while being more efficient since it is carried out under pressure. Food will, however, be cooked in two stages, the first will be pressure cooking itself, and the second will be cooking, which continues during the moment when the pressure cooker gradually releases the pressure. This depression time can be set on most models. Some even incorporate programs, which allow allocating a different level of pressure depending on the type of food to cook. The special feature of pressure cookers is that they allow steaming, especially thanks to their steam basket. Instead of putting the food at the bottom of the pressure cooker, you put it in the basket that will be installed just above the water. When this is boiled, the steam will form and enter the bottom of the basket to reach the food, and thus steam them. Many say that Cooker is version 2.0 of the pressure cookers, so it is necessarily better in many ways. This is not wrong, but it must be said that everyone has its strengths and disadvantages. In the end, the choice will depend on the needs of the buyer. Nevertheless, to help you with your choice, we will try to summarize the greatest characteristics of each. The pressure cooker is reputed to be formidable when it comes to cooking speed. It also saves most of the nutritional qualities of each food. Most models offer steam cooking in addition to pressure cooking. In terms of cooking time, the Cooker is just as effective. As for the different cooking modes, it turns out that the Cooker is a multi-cooker, so it is very versatile (steam, simmering, risotto, reheating, etc.). Since the Cooker is an electrical appliance, it is much more precise in terms of cooking time. Although many models of pressure cookers also have a smart timer. But Cooke is much more open to new technologies. There are even models with USB port, to enjoy more recipes, while with pressure cookers, the number of recipes is rather limited. The Cooker also offers more options, such as delayed start, automatic shutdown, etc. It is especially at this level that the Cooker loses ground against the pressure cooker. The first sells for more than 200 euros, while the second can be from 75 euros. It also remains to determine which is the most energy efficient. How to choose your pressure cooker? The pressure cookers are more or less the same since they all adopt the same principle: they can cook under pressure, and can also steam. But beyond that, there are many particularities from one model to another, such as the number of features, the capacity, the mode of opening, the ease of use, etc. We will try to see some criteria to help you with your choice. You should know that the latest models embark particularly interesting features. As the foods to be cooked are different (meat, fish, vegetables, etc. ), it would be better to be able to apply different pressures in the casserole depending on the food. Exactly, it happens that some pressure cooker models offer up to 4 different programs (or more), which allows choosing a different pressure level. Most offer at least two programs, but other models may offer none. Of course, this will affect the price of the product. Unlike a Cookeo, a pressure cooker can not stop automatically, it will remove it from the heat or turn it off, to stop cooking. But to remedy this problem, some brands equip their product with a timer, which will alert the user when the chosen cooking time is reached. With some products, this timer is removable. It can be placed in the pocket of the user, for example, it can continue to go about its various occupations in the other rooms/floors of the house, and will return to the kitchen when the timer will issue the alert. 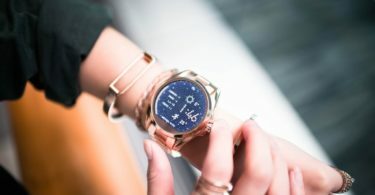 Some models can also include an LCD screen, on which can be displayed for example the temperature inside the pan, the remaining cooking time, the program is chosen, etc. This also offers a more modern look to your pressure cooker, but will logically affect its price. Other models can also be delivered with applications, to install on your Smartphone or your tablet, to access different settings, different recipes, etc. This criterion also has a great influence on the price of a pressure cooker. It goes without saying, the smaller ones will logically be more affordable. Even though, an option-packed 5L pressure cooker could have the same price as another 8L with basic features. It’s up to you to decide according to your needs. For information, a 5L pressure cooker is enough for a couple, even with children. From 8L, we talk about 5 to 8 people. But of course, he does not have to fill the pressure cooker to the brim every time. You can very well choose a high capacity, to predict the arrival of the family or your friends. It is especially in relation to the storage that we must take a look at the dimensions of the product. Is it compact enough to fit in a closet, is not it too bulky if left on the worktop, etc.? Remember old pressure cookers whose open/close mode was to tighten a screw forcefully to get the seal needed. 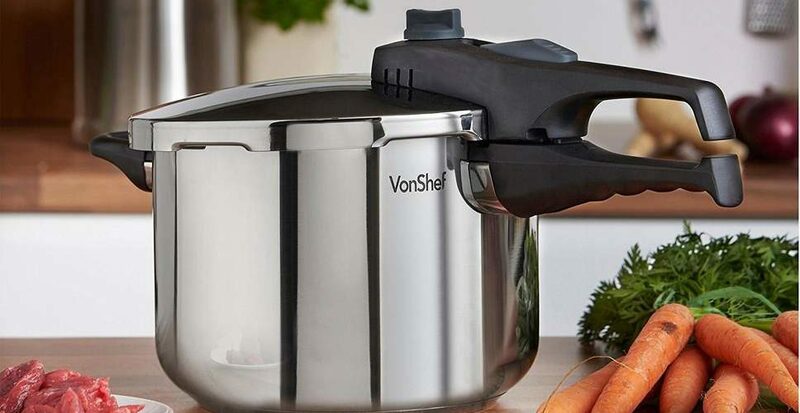 While most basic pressure cookers have more or less kept the same principle, the latest models incorporate much more advanced and easy-to-use systems. This is how we find pressure cookers, whose lid can be opened/closed with one hand.